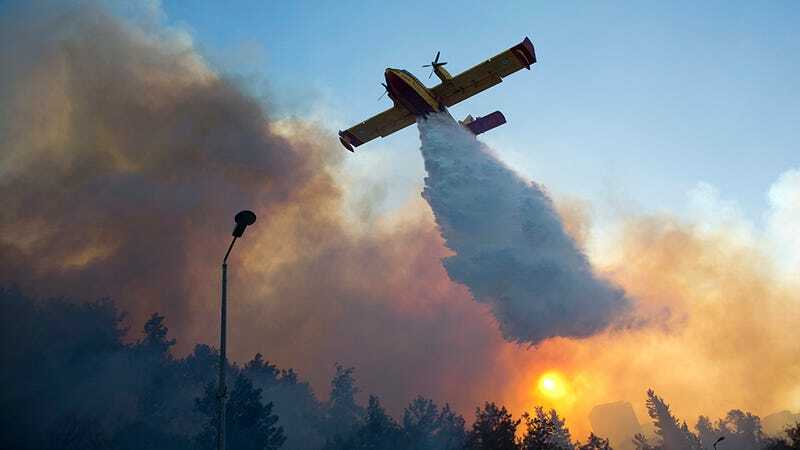 The Israeli government has deployed its fleet of firefighting planes to combat a wildfire that has forced tens of thousands to leave their homes in Israel’s third largest city, Haifa. The fires have been exacerbated by dry, windy conditions. Manpower and larger aircraft are being sent from other countries. Hundreds of military reservists have been called up to help emergency responders with fighting the blazes, attending to injuries and going door to door informing people that they must evacuate. So far, about a fifth of the 280,000 people living in Haifa has been told to leave. According to the New York Times, no serious injuries or deaths have been reported but dozens of people have suffered from smoke inhalation. The blaze in Haifa is the largest of several fires that have cropped up in Israel this week and it is uncertain what has caused it. Prime Minister Benjamin Netanyahu has claimed that the fires are a result of “natural and unnatural” causes. “It’s a crime for all intents and purposes and in our opinion, it is terror for all intents and purposes,” he said this week. He has not elaborated on his certainty that arson is involved. Some Israeli news agencies have labeled the incidents an “arson intifada,” placing blame on Palestinians. For its part, the Palestinian government has offered to send help. Firefighters and planes have already arrived from Cyprus and Greece. Croatia, Italy, and Turkey have reportedly agreed to send help. Vladimir Putin promised to provide two enormous planes that exceed the capacity of Israeli firefighting aircraft. Ayman Odeh, the head of a joint Arab bloc of parties in Israel’s parliament, has called on his fellow citizens to abandon politics and come together to stop this huge disaster.